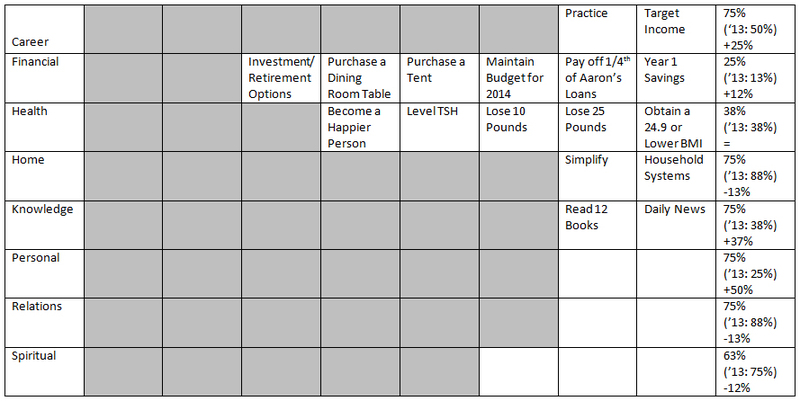 Last year, a lot of my personal goals were actually repeats from other sections. I didn't have anything I really wanted to do for myself. This year, I'm trying to change that. Originally, my personal goals for this year included having a balcony garden and completing a Wreck This Journal. The balcony garden was a total bust. We had some sort of weird late May freeze and it killed everything - well, nearly everything. I still have catnip and green onion. It was so sad though. I had such grand plans. As far as the Wreck This Journal goes, as much as I wanted it for weight loss last year, I'm just not nearly as interested in it anymore. Something about getting sick simply made it less important. Besides, I couldn't finish it this year even if I wanted to. Not anymore. I'll still work on it when I feel up to it. I still want to complete it. I just don't want to complete it on a schedule. 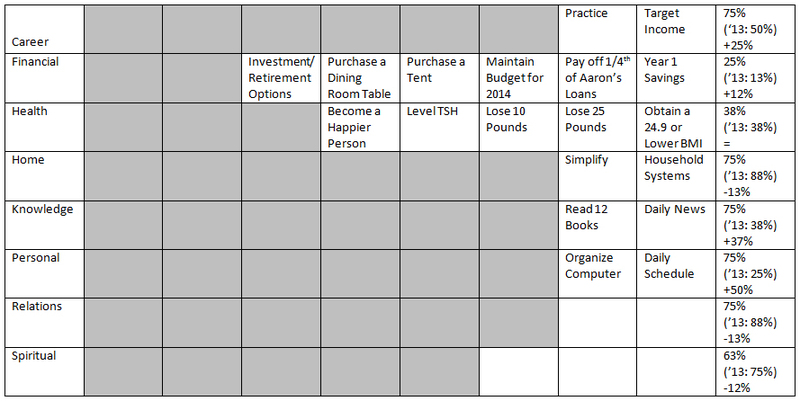 Since my last two personal goals were a bust, I needed to focus and figure out just what I wanted to do with this section. It didn't take me long to sort everything out! My first goal in this section is to organize my computer. I have the worst tendency to just save things to my desktop and run with it. Even more so, my hard drive is burdened with every high MP picture I've ever taken with my new digital camera. It'd be nice to get it all sorted. 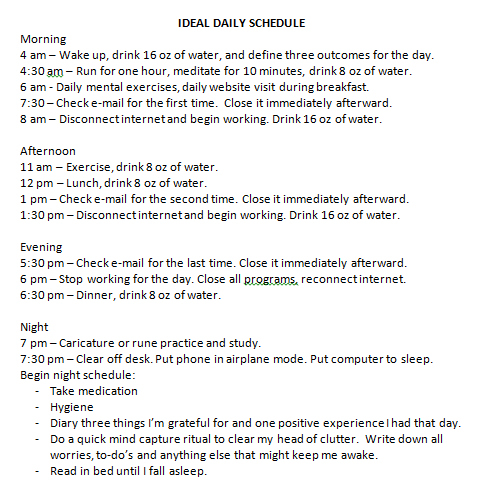 The bigger personal goal I have, however, is to begin adhering to a daily schedule. Working from home gives me a great number of privileges. Unfortunately, I have a tendency to abuse them. The very worst one I misuse is time. Just because I can technically work at any eight hours of the day doesn't mean I should work them between 10 pm and 6 am. That's just ridiculous and it throws my whole life of course. No wonder I struggle with sleeping so much! I sleep all day and stay up all night. How unnecessary. a. It is a work day. b. I have no other obligations that day. c. I am feeling well given my conditions. 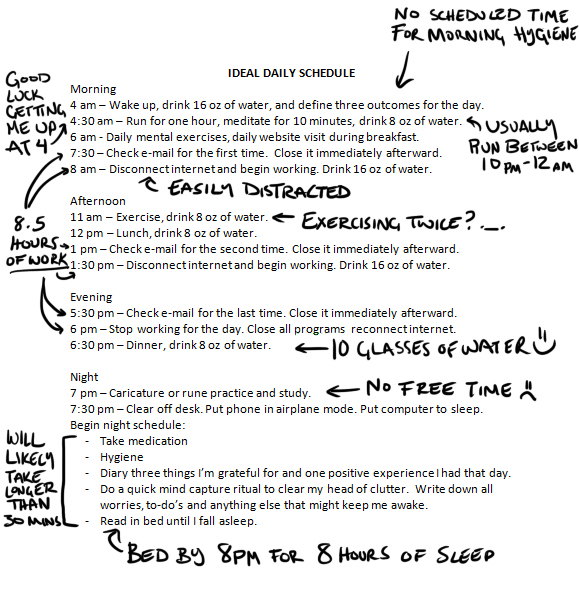 Now let's analyse this in comparison to my current schedule. 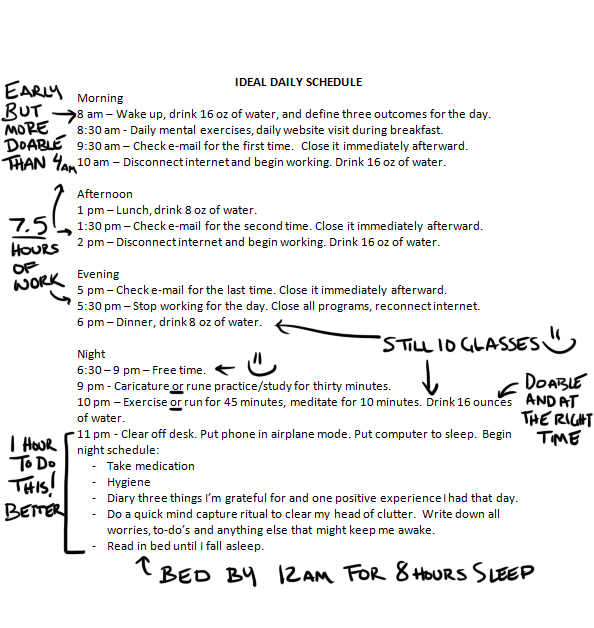 I'd say this is definitely a good compromise on the schedule. 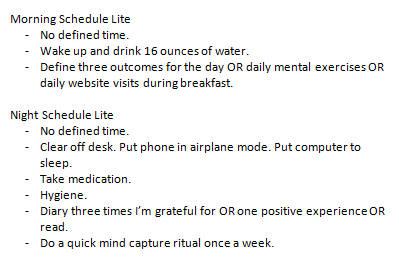 It's doable, includes free time, cuts back on work a bit, and gets my exercise in. And just what are the "lite" versions of the schedule? I would also like to take Sundays and Mondays as my "sort of" days off. By sort of, I mean I'll likely still be working. But Sunday gigs tend to be shorter then Saturday or Friday gigs, with a few exceptions here and there. And on Monday, I'll still need to use my e-mail and take commissions, but I won't be drawing that day. 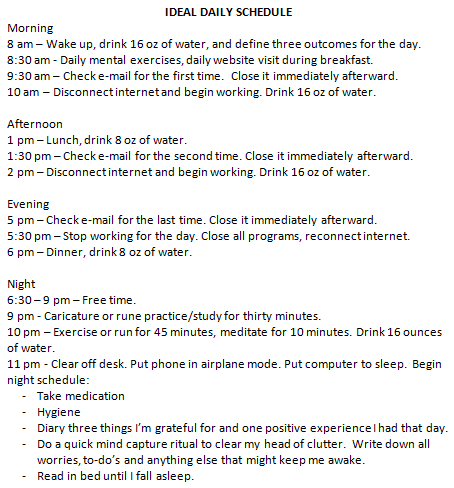 On those days, I won't have to wake up early, I can exercise at any time, and I can skip some items on my schedule. Those are also days I'd like to consider "Maintenance Days." If I'm behind from something on my list or if the house needs to be cleaned, this is the perfect set of days to do it in! Organize the [section/folder] of My Computer. - Done | Not Done - 0% Complete. 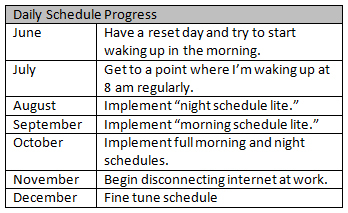 [Daily Schedule Task.] - 0/X Days - 0% Complete. What are your 2014 personal goals?